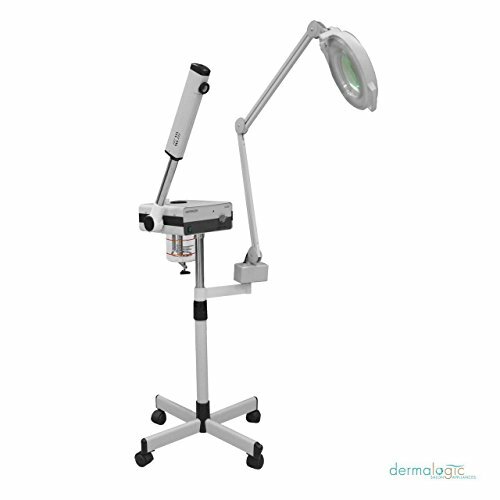 The Seagoville Steamer with Magnifying lamp is optimal for any spa salon. It's the best of both worlds. The facial steamer provides warm steam used to cleanse pores and rejuvenate tired skin. The spray arm is adjustable and swivels in both directions, so you can place it wherever it is most convenient in relation to your facial bed, or you can move the whole unit around with ease - especially with the rolling platform. This machine will ease the worries of you and your clients because its UV light decontaminates the steamer head and the unit shuts itself off. Additionally, it features a large glass water reservoir enclosed in acrylic to prevent breakage and comes with a magnifying lamp for deeper visibility of your client's skin. The 5-diopter magnification allows you to get a full view of the status of the skin so you can provide the best treatment. The fluorescent lamp surrounding the magnifying glass enhances your visibility and provides a spotlight right where you need it. Give high-quality facials by including this facial steamer in your routine.